The Oakley brand is universally recognized and is synonymous with innovative, quality craftsmanship. Oakley is a leading name in sports eyewear because it offers athletes stylish prescription sunglasses that are made with cutting-edge design and technology so that it not only looks good but can also withstand harsh environments and truly extreme conditions. Oakley has perfected sporty wrap prescription sunglasses and shields and has modernized interpretations of other classic designs. The Oakley prescription sunglass collection is offers a wide variety of frames in an exciting array of frame colors and performance-driven lens shading. Due to manufacturer's restrictions, Oakley products can only be shipped to U.S., Canadian and Caribbean addresses. APO/FPO shipping is available. Stylish square shaped frame provide protection of the eyes and are suitable for many face types. Oakley Holbrook frames are capable of transitioning from lifestyle to outdoor frames easily. Available in more than ten different color combinations and styles. Oakley Holbrook Sunglasses are constructed of Oakley O Matter® frame material for lightweight durability. 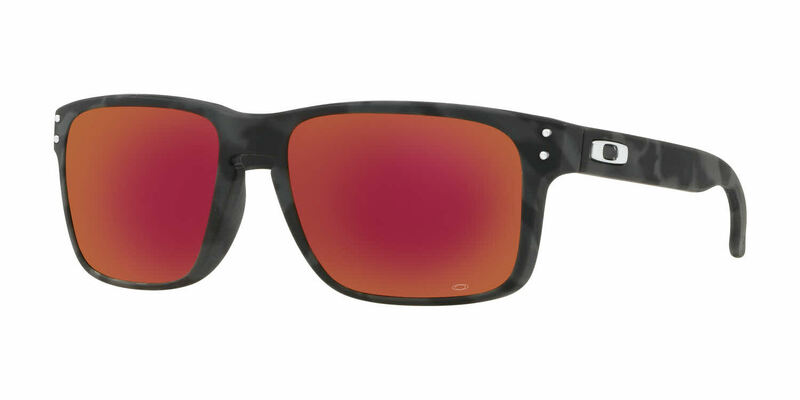 Holbrook Sunglasses features the Oakley signature O on the temples. Keyhole bridge distributes weight for those with a sensitive bridge. Meets the ANSI Z87.1 standards for impact protection. Oakley carrying case and cleaning cloth included. Due to manufacturer's restrictions, Oakley products can only be shipped to U.S. and Caribbean addresses. APO/FPO shipping is available. I purchased these for my husband and wasn't sure if the frames would be large enough. They are perfect. The lenses are large and have great coverage. I purchased the gunmetal gray frames and they are sharp! A very unique color. Bought these for a prescription replacement of similar sunglasses. Already really like the style and they stick to your head well when doing activities so you don't have to worry about them falling off. Good all around sun protection, very little gaps to let sun in from the sides of the frames. Prescription felt a bit off the very first time wearing but since getting used to them, very pleased with the product. My husband ordered these prescription Oakleys and he loves them! Frames Direct was great at letting us know the progress of the order. This is a great site to buy name brand glasses for much less than other places. Okay. Nice frames but kinda tight if you have a bigger dome.